ExSEPSIS - Exiting with excellent care! Does your hospital want to work on sepsis readmissions as a performance improvement project? HAP HIIN is proud to announce the newly formed sepsis readmission project “ExSEPSIS - Exiting with Excellent Care!” which will teach participating organizations how to formulate a plan to improve sepsis readmissions in their hospitals. Project managers will work with hospitals on interventions selected to decrease readmissions following a severe sepsis or septic shock discharge diagnosis. Assistance will be provided by the sharing of best practices and lessons learned, educational events, patient/family educational training, and individual hospital coaching. 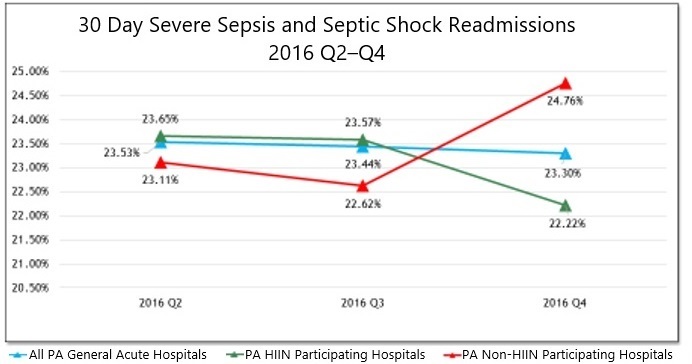 The first year goal is a 6% reduction in 7-day, and 30-day all cause, all payor severe sepsis and septic shock readmission rates. For more information or questions about this exciting new initiative designed to help drive down your sepsis readmissions, including how to sign up, contact HAP’s project coordinator Janice Schan, Maggie Miller, sepsis project manager, or Sandy Abnett, readmission project manager.